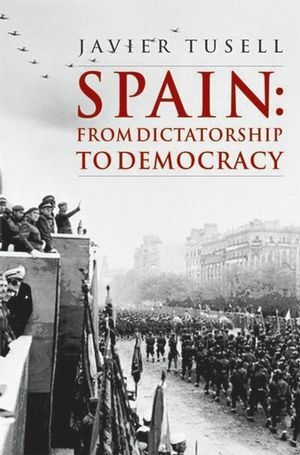 This comprehensive survey of Spain’s history looks at the major political, social, and economic changes that took place from the end of the Civil War to the beginning of the twenty-first century. Javier Tusell was Professor of Contemporary History at the National University of Distance Learning (UNED). Best known as a historian of contemporary Spain, he published more than 50 books on the subject in his lifetime. During an early foray into politics, he negotiated the return to Spain of Picasso’s anti-war masterpiece, Guernica, and was elected UCD councillor for Madrid in 1979. Latterly he became a respected media commentator on Spanish history and especially the Franco dictatorship. Rosemary Clark, college lecturer at Downing College, is an affiliated lecturer in Spanish at the University of Cambridge specializing in Modern Peninsular Spanish literature, history, and culture. Particular interests are post-colonialism, Spain and Africa, religious issues, and regionalism. Franco: Biography and Political Practice. Francoism: A Form of Dictatorship. Victors and Vanquished: The Disasters of the Civil War and Repression. Exile and the Start of the Postwar Period in Spain. 1. The Temptation of Fascism and the Will to Survive (1939–51). A Failed Attempt to Make Spain Fascist. The Temptation to Intervene and Internal Conflict (1940–2). Stumbling Progress towards Neutrality (1942–5). Cosmetic Change: Regime Politics between 1945 and 1951. Opposition from Survivors: The Spanish Left from 1939 to 1951. The “Dark Night”: Autarchy and Rationing in the 1940s. 2. The Years Of Consensus: The High Point of the Regime (1951–65). The End of International Isolation: The Concordat and Pacts with the United States. Spain and Europe: Colonization of Morocco Ends. The Regime and the Opposition up to 1956. For or against Falange: Political Life under the Regime between 1956 and 1965. The Easing of Autarchy and the Change in Economic Policy. From Political Opposition to Social Opposition. Culture in the Francoist Middle Period: The End of the Penitential Years. Daily Life and Leisure Activities. 3. Economic Development, Apertura, and the Late Franco Years (1966–75). Economic Development in the 1960s and 1970s. The Modernization of Spanish Society. The Change in Spanish Catholicism. The Succession. Matesa and Internal Splits in the Regime. The Late Franco Period: Carrero Blanco as President. Late Francoism: Arias Navarro’s Government. Opposition Activity: The Road to Unity. Spain and the Western World. Late Decolonization: Guinea and the Sahara. Spain at the Time of Franco’s Death. 4. The Transition to Democracy (1975–82). The Monarchy: King Juan Carlos I. The Death-throes of the Past. Adolfo Suárez: The Road from Liberalization to Democracy. Facing Difficulties: Terrorism and the Military Coup. The Long Road towards a Constitution. An Unresolved Issue: Nationalism and Terrorism. The Triumph and Fall of Adolfo Suárez. The Army and the Transition: February 23. Calvo Sotelo’s Government and the Crisis in Center Politics. Economic Policy and Social Change. October 1982: The End of the Transition. 5. Consolidating Democracy: The Socialist Government (1982–96). Felipe González and the Two Souls of Spanish Socialism. The Socialists’ First Term in Office. Reform of the Armed Services, an Economic Update and Foreign Policy. A Means of Consolidating Democracy. The GAL. Elections and Public Opinion in the Second Half of the 1980s. The Second Term in Office: Social Policies and Union Protests. Spain and the World. Policy on the Autonomous Communities: A New Vertebrate Structure for the Spanish State. The Loss of an Absolute Majority. A Tense Term of Office (1993–6). The 1996 General Election. Drawing up the Balance on the Socialists’ Time in Government. Culture in the Post-Franco Period. From a Time of Rediscovery to a State Culture. 6. The Turn of the Right (1996–2004). The Popular Party in Power: José María Aznar. Success in Economic and Social Policies. The Dark Side of the Right. A Pluralistic Spain: Nationalities and Terrorism. Government and Opposition. The Elections in March 2000. The Style of Government with an Absolute Majority. The Limits of PSOE Renewal. The Policy of Making Pacts and Breaking with Consensus. The PP: Idyllic Peace and Neo-conservatism. From More to Less: Government Policy in the Second Four-year Term.